Jet Company's roots trace back to a farmer's garage where he started building fencing equipment in his free time. In the summer of '56, a devastating hail storm forced that farmer into designing the first Jet Wire Roller. In '58 a post driver was designed and both products were offered through the Sears & Roebuck Catalog. Montgomery Ward, Wheelers & Tractor Supply soon followed. A larger building was constructed on the farm to accommodate production of a wagon box. Due to increased demand, land was purchased and Jet Company moved to Humboldt Iowa, where it's production still occurs today. New Truck Boxes introduced – combo of grain & livestock boxes, manufactured in 10' to 24' lengths. Suffered a Fire - Used opportunity to increase manufacturing space during reconstruction. Added several products including hoists, tarps, augers, and mobile signs. Building addition to allow room for a new product: Steel Grain Hopper Bottom Trailers. Designed and Patented Air Ride Suspension system for motor homes & RVs. Designed an Aluminum version of the Grain Hopper Bottom Trailers; lighter weight, increased payload. Became Winnebago's sole supplier for the Air Ride suspension system. Purchased 10,000 sq ft Building North of Plant. Moved Air Ride Suspension production to this building to meet Winnebago's demand. Designed rounded slopes and hoppers on all grain trailers to improve flow of sticky materials. Underwent another building addition to add production of Flatbed and Drop Deck trailers. Introduced a single axle flatbed trailer designed specifically to haul field tile rolls. Started manufacturing Tag Trailers in 10, 20, and 25 ton models. Designed a flatbed trailer to haul poultry. Designed a drop deck trailer for boat manufacturers to transport several boats to distributors in one trip. Jet Company acquired the empty building (90,000 sq ft) south of their existing building for R & D of future trailer models. Building expansion (4000 sq ft) to join buildings together. Designed the Ramp and Bevel Grain Door and added to both aluminum and steel grain hopper trailers to reduce the effort for the user to open the hopper door. 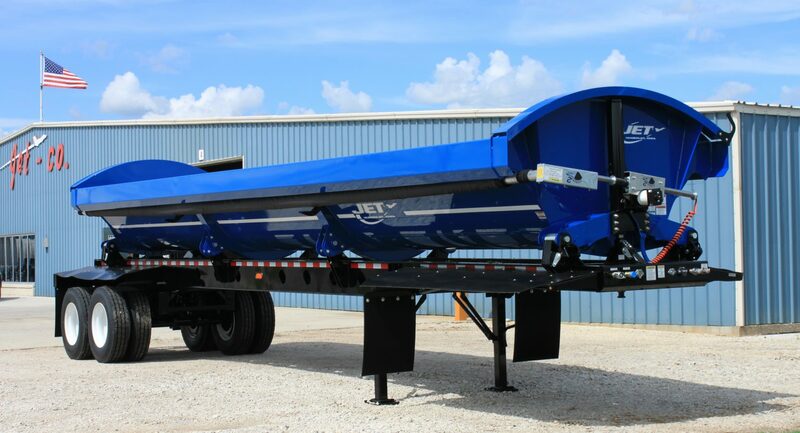 Jet Company introduced their Side Dump and Detachable Gooseneck Trailers to the construction market. Underwent another building addition to allow for growth of construction trailer production. Continued research of new products and improving current trailer designs and functionality.